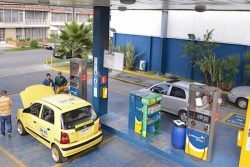 The Colombian Natural Gas Association, Naturgas, has published a study conducted by the industry to analyze the competitiveness of different fuels for urban transport. Compressed Natural Gas (CNG) or Vehicular Natural Gas (GNV) as it is known in Colombia, clearly demonstrates its economic advantage. “Natural gas is the most competitive clean energy for mobility needs. The latest data show that the competitiveness of vehicular natural gas will improve in relation to the current situation, due to the increase in oil prices and the availability of local natural gas”, said Orlando Cabrales Segovia, president of Naturgas. The study “Construction of a competitiveness index for GNV in Bogotá, Cartagena and Cali” was carried out by the companies PROMIGAS, GDO (Gases de Occidente) and VANTI (formerly Gas Natural Fenosa) to compare the price of natural gas with the price of petroleum derivatives in Colombia. A second study compared electric and CNG mobility in collective public transport of passengers in urban areas. Many users of public and private transport have switched to CNG for its economic benefits, offering savings of around 50% and 35% compared to gasoline and diesel respectively. In the case of heavy vehicles, for example, a truck tractor with a 100% dedicated CNG engine represents savings in excess of 35% in fuel costs. The second study concluded that natural gas is cheaper than the electric alternative and has almost the same benefits for air quality. It found that opting for electric fleets implies raising public transport rates or allocating additional resources from municipal budgets to subsidize the service. Also, migrating to electric fleets would imply raising tariffs for public transport users. In the Colombian setting, EVs were found to be: more costly; reduce operational flexibility; have uncertainty associated with battery duration, disposal and replacement; and require the construction of specialized infrastructure that can be very demanding in financial resources and urban land.